Gerald’s memory of St. Bernard’s role as a crusade preacher, though mentioned by Robert of Torigni, found few other echoes among the English writers of my period. Of the historians I have seen, only Ralph of Diceto made any significant allusion to his role. Ralph described Louis VII’s conflict with the Church over the archbishopric of Bourges. The affair was resolved thanks to Bernard’s mediation, and the king agreed to back down and go to Jerusalem to atone for the sacrilegious oath he had sworn during the quarrel. He thereupon took the cross and prepared for his crusade. The idea that Louis was concerned principally with a pilgrimage for the expiation of his sins rather than with undoing the damage wrought by the Muslim capture of Edessa has been discussed elsewhere by Aryeh Grabois; Ralph of Diceto is the only one of these English writers to suggest that the motivation for the crusade was anything other than the needs of the Holy Land. No English author made any reference to the crusade on the eastern marches of Germany, but several followed Henry of Huntingdon or Robert of Torigni in mentioning the successes at Lisbon and in Spain. Henry had contrasted the absence of God’s grace at the siege of Damascus with the divine aid that had attended the more lowly crusaders in Spain and Portugal and quoted the first epistle of St. Peter (5 v.5): “For God resisteth the proud, but giveth grace to the humble.” He took evident pride in noting that the greater part of these men had come from England. But despite this English involvement, no one could add anything; Gervase of Canterbury, for example, was content simply to record the victories at Lisbon and Almeria, stripping away all Henry’s theology.7 It was the expeditions of Louis VII and Conrad III that continued to hold the center of attention. So what went wrong? For Henry of Huntingdon, God had spurned the efforts of the crusaders: their fornication, adultery and other wickedness had earned His displeasure, and so it was that the armies were betrayed by the emperor of Constantinople and harried by the sword of the enemy; Louis’ hope of restoring his reputation at Damascus had come to nothing as he lacked God’s grace. Robert of Torigni was scarcely less theological in his explanation. He preferred not to dwell on the hardships, pestilence and enemy attacks suffered during the passage through the Byzantine empire, ascribing them to the oppression of the poor and the spoliation of churches that had attended the start of the expedition.8 But of the later writers, only William of Newburgh, his near contemporary Gervase of Canterbury, and the early thirteenth-century Cistercian, Ralph of Coggeshall, attempted an answer that was not totally derivative. Gervase and Ralph are notable for their secular tone. Gervase mentioned the foolhardiness of the crusaders and the efforts of the Saracens before going on to recount the story of how the Damascus expedition was frustrated by the treacherous dealings of the Templars, who accepted a huge bribe from the citizens to raise the siege only to discover too late that what they had thought were gold coins were in fact copper. Ralph of Coggeshall also reported that the siege was raised when the Templars accepted a bribe, although in his case he believed that it had been paid by Nur al-Din.9 The idea that Templar venality was to blame was not new – earlier writers including John of Salisbury and the Wurzburg Annalist had already repeated the allegation 10 – while other authors, notably William of Tyre and Michael the Syrian, alluded to a bribe which turned out to be in counterfeit money.11 So far as I am aware, Gervase is the earliest writer to link the counterfeit bribe with the Templars, although the tale may have had a wide circulation; there is another version in the early thirteenth-century Chronique d’ Ernoul.12 But despite their popularity among later writers, it is most unlikely that these stories have any factual basis. The accusations against the Templars are clearly a further symptom of the mounting antipathy towards the Order which elsewhere in the later twelfth century found expression in the writings of, among others, William of Tyre and Walter Map,13 while the story of the valueless bribe probably appealed to clerical writers because of its moral dimension, showing that avarice and treachery do not prosper. Both Gervase and William of Tyre spoke of the frustrated expectations of the recipients as nothing short of miraculous, although in Gervase’s case there is more than a hint of sardonic irony. William of Newburgh is very different. In his account we find theological and mundane explanations for the failure of the crusade juxtaposed at almost every turn. Having brought the remnants of the French and German armies to Jerusalem, William ended his account of the crusade abruptly: “They then returned ingloriously, having achieved nothing of note.”16 There is no reference at all to the Damascus campaign. Instead he described the death of Prince Raymond of Antioch in battle – this was in 1149 – and King Baldwin III of Jerusalem’s rescue mission to northern Syria, and he then mentioned the capture of Gaza (c.1150) and Ascalon (1153). Once again God, who resisteth the proud, had given grace to the humble. Interestingly, William has nothing but praise for the Latins settled in the East. There was also a distinct lack of curiosity. None of the English historians who described the Second Crusade, nor, so far as I am aware anyone else, addressed the question of why, if the fall of Edessa had been the occasion of the crusade, there had been no attempt at its recovery. More significantly, it is difficult to detect any impact on their accounts of the Second Crusade from the events of 1187-92. 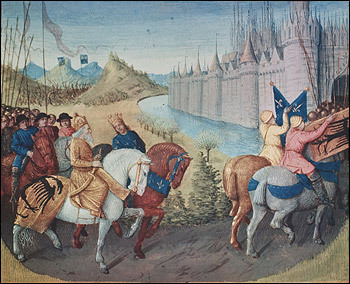 Thus no one suggested that the sinfully obstructive behavior of the Latins in the East in the late 1140s prefigured the wickedness which led to the loss of Jerusalem, and no one seems to have drawn any parallels or contrasts between the fortunes of Louis or Conrad and those of Richard, Philip Augustus and Frederick Barbarossa. William of Newburgh, with his multiplicity of human and theological reasons for the failure of the expedition, and his appreciation that successes in the East in the years after 1148 did much to efface the disasters, is by far the most interesting, but even he is circumscribed by his limited information and by an inability to see these events in a broader historical perspective. Substantial numbers of Englishmen and Normans had joined the expedition, but echoes of their recollections are conspicuous only by their absence. It was not that later twelfth-century writers were unaware of the events of the Second Crusade: Ralph Niger, writing at the time of the Third Crusade, reminded his readers that the Muslims habitually curtailed the crusaders’ sources of supply and obstructed their routes, and he cited the experiences of Louis and Conrad as proof; elsewhere he lampooned Bishop Otto of Freising for his part in persuading Conrad to participate in the expedition.19 Interestingly, St. Bernard escaped his stricture. Nor are accounts of the Third Crusade completely devoid of references to the Second: Roger of Howden, for example, had the crusaders tell the Muslims in 1191 that they intended restoring the Christian possessions to the frontiers as at the time of Louis’ sojourn in the East.20 But the English writers were either locked in a historiographical tradition that precluded any original investigation of events before their own lifetime, or presumably took the view that the crusade had been too painful a failure for them to want to explore it any further. 1. Constable, “Second Crusade”. I wish to thank David Bates and Jonathan Riley-Smith for their comments on an earlier draft of this chapter. 2. Henry of Huntingdon, pp. 279-81; Robert of Torigni, Chronicles, pp. 152, 154-55; Roger of Howden, vol. 1, pp. 209-10; Ann. Waverleia, pp. 231-33; Ralph of Diceto, vol. 1, pp. 256-58 (cf. p. 291). For Roger of Howden’s singular account of the First Crusade, see: Gillingham “Howden”, p. 60. 3. Gerald of Wales, vol. 1, p. 76 (cf. vol. 2, p. 152). 4. Ralph of Diceto, vol. 1, pp. 256-57; Grabois, “Crusade”. 5. Wm. of Newburgh, vol. 1, pp. 84-87. 6. Wm. of Tyre, Chronicon, p. 635. 7. Henry of Huntingdon, p. 281; Genrase of Canterbury, vol. 1, p. 138. 8. Henry of Huntingdon, pp. 280-81; Robert of Torigni, Chronicles, p. 154. 9. Gervase of Canterbury, vol. 1, pp. 137-38; Ralph of Coggeshall, p. 12. 10. John of Salisbury, p. 57; Ann. Herbipolenses, p. 7. 11. Wm. of Tyre, Chronicon, p. 769; Michael the Syrian, vol. 3, p. 276. Cf. Tritton & Gibb, p. 299; Bar Hebraeus, p. 274. I am indebted to Martin Hoch for these references. 12. Chron. d’Ernoul, p. 12. 13. For William, see: Edbury & Rowe, pp. 125-26; Walter Map, pp. 62-7, 72-3. 14. Wm. of Newburgh, vol. 1, pp. 92-5, at p. 92. 16. Wm. of Newburgh, vol. 1, pp. 94-7, at p. 94. 17. Both Roger of Howden and Ernoul record another story of this type: Louis visited Roger of Sicily on his way home from the crusade, and Roger allegedly induced him to place a crown on his head, thereby validating his kingship (Gesta Regis Henrici II, vol. 2, p. 202; Chron. d’Ernoul, p. 13). 18. John of Salisbury, pp. 11-12, 52-9, esp. pp. 52-3; Richard of Devizes, pp. 25-6; Walter Map, pp. 474-77; Gerald of Wales, vol. 8, p. 300; Wm. of Newburgh, vol. 1, pp. 128-29. 19. Ralph Niger, pp. 80 (cf. p. 70), 224. 20. Gesta Regis Henrici II, vol. 2, p. 174. This entry was posted in Articles and tagged 12C, 13C, Bernard of Clairvaux, Crusaders, England, France, Germany, High Middle Ages, Jerusalem, Louis VII, Monasticism, Normans, Second Crusade, Third Crusade, Wales. Bookmark the permalink.